It’s 3am and I’m lying in bed tossing and turning. Tomorrow is our first flight with our 2-month-old; we’re flying to Houston for a good friend’s wedding. Little munchkin seems to have finally fallen asleep again but I’m wide awake and anxious. Have I packed everything? What if baby starts crying on the plane and doesn’t stop? What if baby can’t fall asleep? Should I bring the stroller, the bjorn, the sling, or the moby wrap? Maybe I should bring them all! Although my eldest is now 5, I remember those sleepless nights worrying about our first few trips with our first baby as vividly as if it was just last night. Some newbie moms are truly easy going, but that was not me. Those first few trips we took with a baby were accompanied by a plethora of questions, frantic shopping, restless nights, and late night strategizing. This is for all you new moms who are sitting awake freaking out about your first flight with baby. 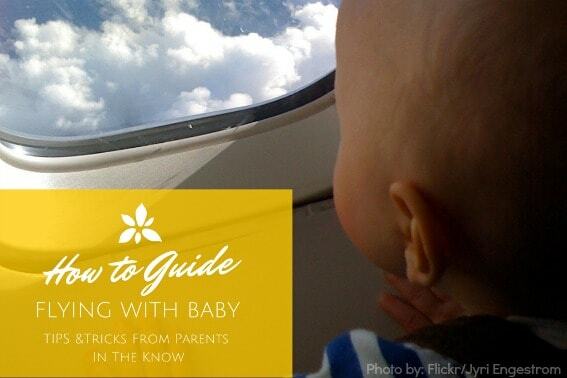 I’m going to walk you through all the steps of a typical first flight with your new baby, painting out the details so you know what to expect and giving you some tips I’ve learned over the years that will help smooth out your first flight together. Most moms with toddlers will tell you that flying with baby is so much easier…but just because flying with a toddler is harder, it doesn’t mean that flying for the first time with baby is a breeze. Don’t be too hard on yourself, your anxiety is very normal. I’m here to explain what you can expect with tips on how to sail through (or at least cope with) the road bumps you’re like to face. Baby still on board? Check out this guide to traveling during pregnancy. First up, Booking your flight.